Aleta Starosta is an Senior Research Analyst in The Cloudburst Group’s Land Tenure and Natural Resource Management practice area. She designs, implements, and disseminates impact and performance evaluations in a variety of sectors, including governance, land and natural resource management, environment, and agriculture. 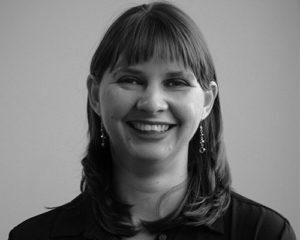 Ms. Starosta has seven years of experience leading international data collection efforts on more than a dozen large scale impact evaluations in Africa, primarily randomized control trials and difference-in-difference designs. These evaluations have focused on interventions designed to improve land tenure in the context of climate-smart agriculture (Zambia), artisanal diamond mining (Guinea), pastoral rangeland management (Ethiopia), and community forest management/REDD+ (Zambia). She has also contributed to evaluations in a number of other sectors, included agriculture (Zambia), WASH (Zambia), public health (Zambia), Small and Medium Enterprises (Uganda) and girl’s and women’s empowerment (Zambia). Ms. Starosta holds a Master’s degree in Public Policy from the Gerald R. Ford School of Public Policy at the University of Michigan.